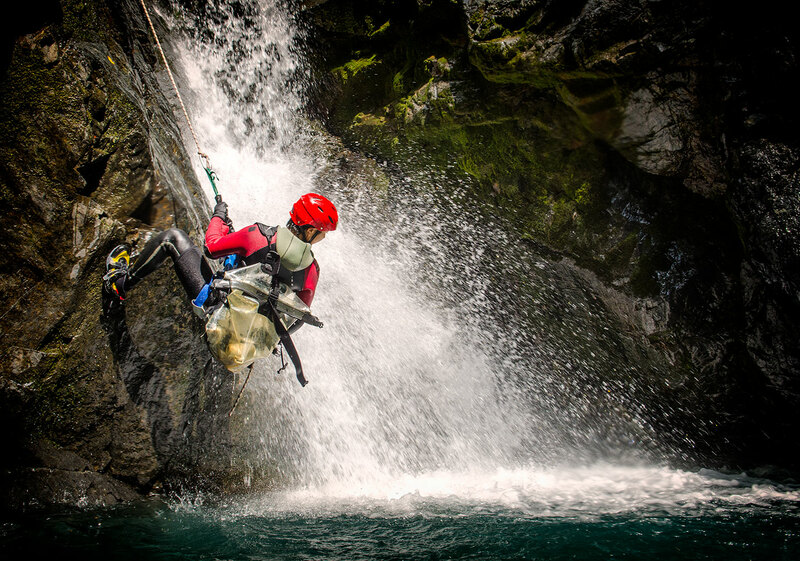 Explains the basics of what equipment is required for canyoning. 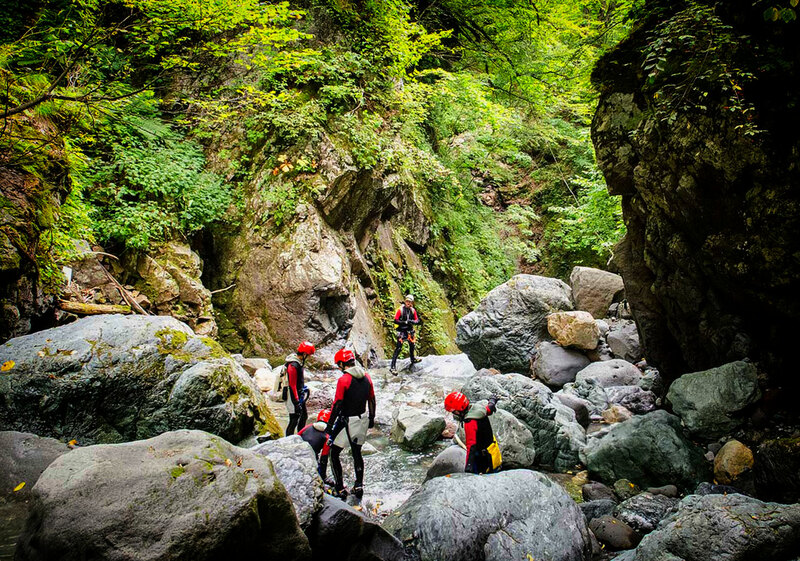 Canyoning is equipment intensive. This section explains the basics of what is required when exploring canyons or doing canyons outside of a guiding company. With any equipment you purchased or take with you, always know how to use the equipment and use it well! As with all gear it it important to note down when you purchased it, damages, uses and regularly maintain you gear in good working order. 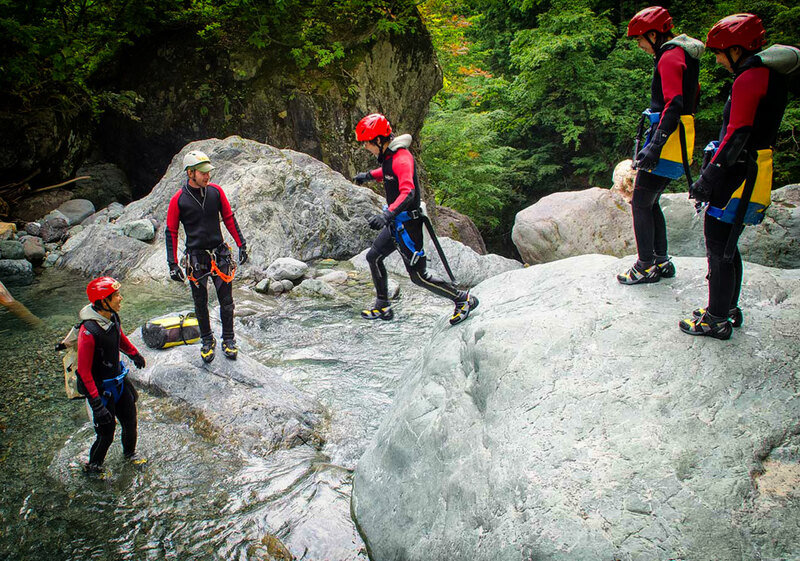 Wetsuits are commonly used in canyoning but not all canyons well require a wetsuit. Dry canyons which are found in certain areas generally do not require a wetsuit but areas with water usually require a wetsuit either due to the nature of the canyon or the temperature of the water. 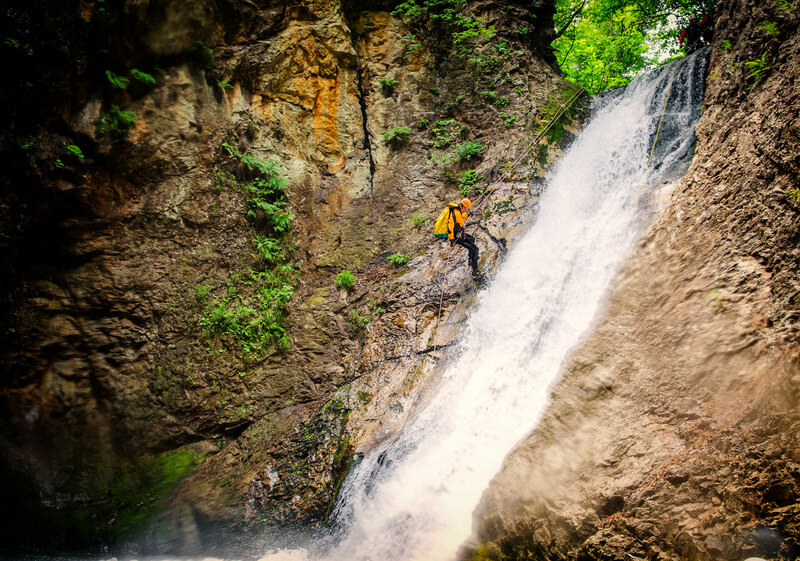 The wetsuit will depend on where you go canyoning and the amount of canyoning you intend to do. It needs to be thick enough to provide warmth for the canyons you intend to descend and flexible enough to allow movement when swimming, jumping, abseiling and climbing. The wetsuit should also be form fitting and be resistant to abrasion by having laminated areas on the knees, elbows and rear. Neoprene wetsuits from 3mm to 7mm are quite common form most canyoning. For the type of construction we can choose between tailor made or commercial products and of course subject to the play of sizes. Custom made wetsuits are considerably more expensive. They usually come in two different form factors, single piece or two piece consisting of a Jacket and a Long John. Water temperature is 18° or more a full length wetsuit of 2mm ~ 3mm should acceptable. Water temperature is between 14° ~ 18° cold a full length wetsuit of 4mm ~ 5mm should acceptable. Water temperature is below 14° a Two Piece wetsuit of 4mm ~ 5mm would be required acceptable. Ice canyoning a Dry Suit is considered the minimum due to the extremes of the season. 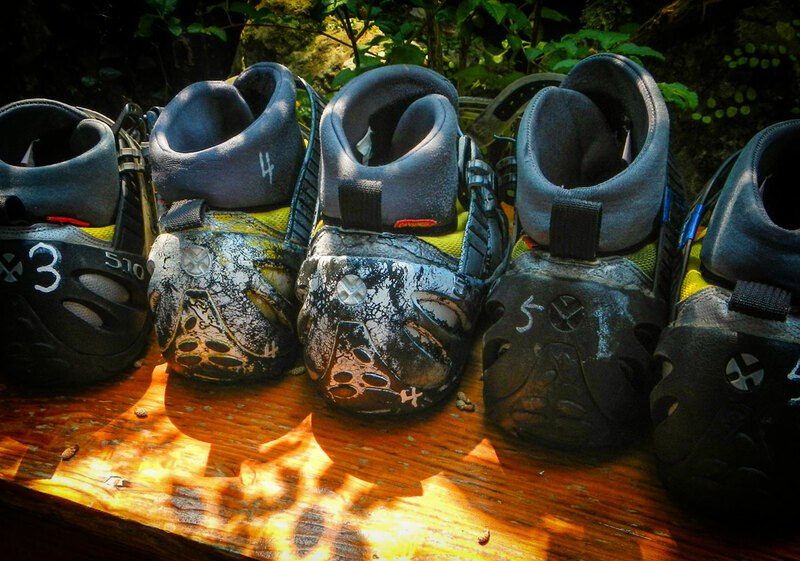 A good canyoning shoe makes all the difference allowing you to move quickly and safely. Until a few years ago shoes were not expressly designed for canyoning but currently there are several manufactures that design products specifically designed to meet specific needs. Three of the most common shoes available on the market today are listed below. These shoes have consistently been tested and used in many canyons around the world. 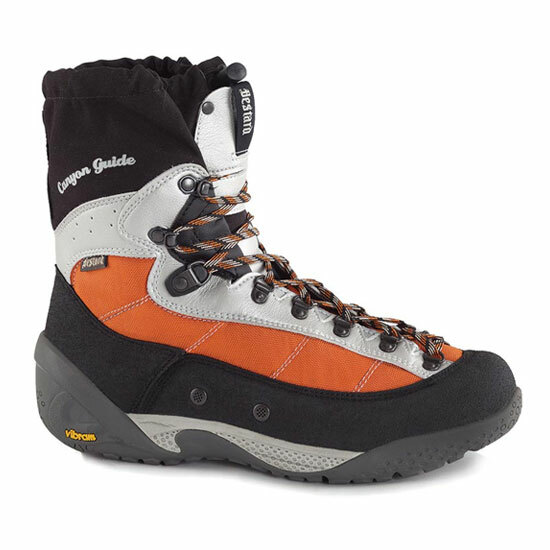 The Bestard Canyon Guide is more like a traditional boot with a lace up closure. With a very good grip made by Vibram and is super light and comfortable. 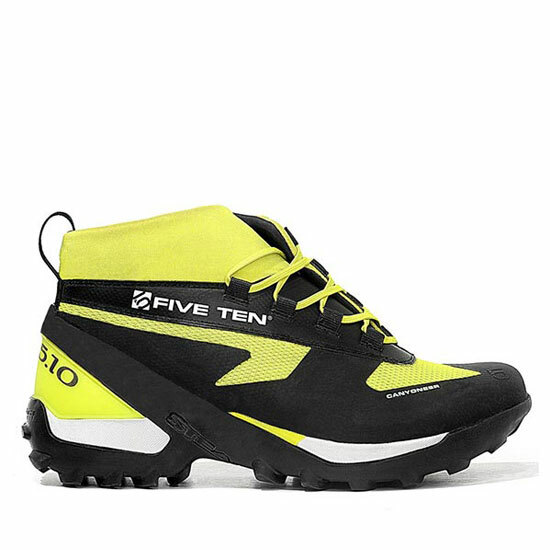 The Five Ten Canyoneer is considered a good versatile shoe for canyoning. Good grip on wet surfaces. 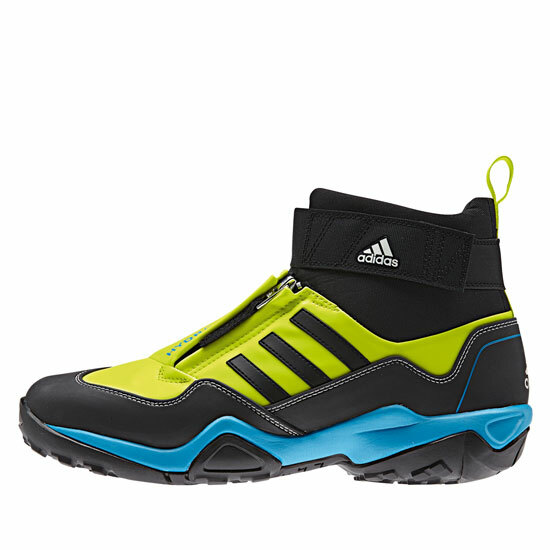 Latest entry on the market is the Adidas Hydro Pro. The features are similar to a Five Ten Canyoneer, with a good sole and a different lacing system. There is no helmet made specifically for Canyoning so a helmet used for climbing or caving (Certification EN 12492) is recommended. It is advisable not to use canoe, kayak or cycling helmets for canyoning. These style of helmets have openings at the top of the helmet and these could potentially cause issues if rocks or equipment fall from height. 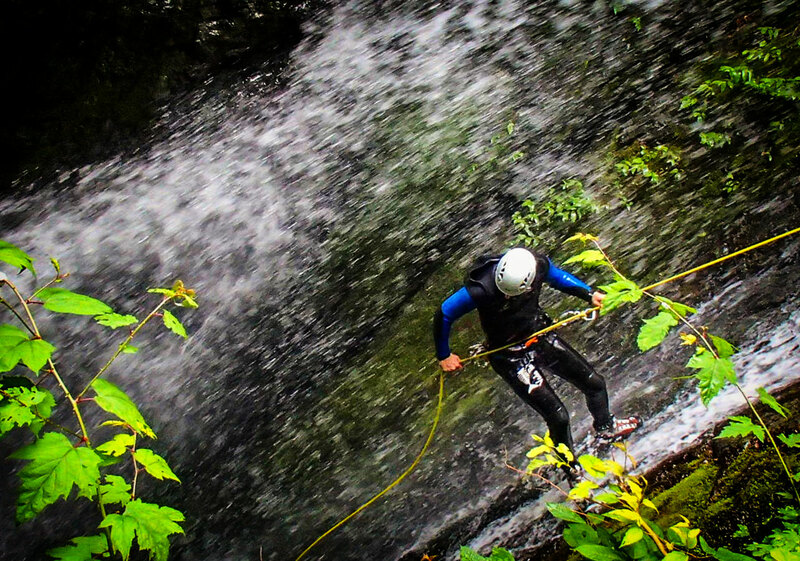 There are several manufactures of canyoning harnesses, with an attachment points parallel to the body, side gear loops and a protective seat. Not all canyoning harnesses have the same fit so choose a model that is adjustable and is comfortable. The central attachment point must be high enough to prevent overturning when in waterfalls. It is advisable not to use a standard light weight climbing harness as these do not hold up to abrasion as well and also introduce a twist on the main attachment point. Carabiners are essential and it’s recommended that they all should be locking types. Large HMS Carabiners like the Petzl William are one type that is suggested. Auto Locking are carabiners are acceptable but screw gate is preferred. Selecting carabiners is personal choice but it is advised that they be all the same type and brand. Always have spare carabiners with you and don’t forget to mark them with your own particular branding such as tape or nail polish. Lanyards are essential for manoeuvring in the canyon and allows you to attach safely to an anchor or exposed part. The lanyard’s used in canyoning is double, “Y”, with one long and one short. Lanyards can be made with dynamic rope and a good alternatives are made my equipment manufactures although you cannot adjust the length of the tails. When using lanyards, you should keep them under tension in situations of potential risk factor of fall is not greater than one. Lanyard’s made with inelastic materials, such as Kevlar cords would not stand in the event of a fall. Daisy-chains are too sensitive and the use of which is likely to cause fatal mistakes. Whistles are fundamental for communication in a canyon and must work well even when wet. The recommended whistle for canyoning is the FOX 40 Classic. It should be fastened to the helmet with a thin elastic cord that reaches the mouth and also break if needed. Do not tie a whistle to the zipper of the wetsuit around neck or keep it in the pocket of the backpack. The multi-purpose belay device that is used called an 8 Device. The important thing is that both classical and generous in size. Alternatively, you use the Petzl Pirana, Kong Oka, or one of the multitude of other descenders available. Any descender is used, the important thing is that it is absolutely matched with a Large Locking HMS carabiner. The carabiner must be able to handle two ropes system. Also you can loose either screw lock or auto-lock carabiners. The decision is up to yourself. Do not use carabiners without a locking function, Oval or D-Shaped or small. At least 1 x 120 cm and 1 x 60cm. Used to connect two anchor points, foot loops for ascending or to extend an anchor. Throw bags are essential in swift water and should be carried when descending canyons. Most throw bag ropes floating low weight ropes so they are designed for rescuing people and not for abseiling. A diving mask is necessary to inspect the canyon pools before jumping or a sliding. Canyon formations change all the time so rocks and other debris may have moved since the previous time. They are also useful incase you lose something on the bottom. The diving masks, however, cover over the eyes of even the nose; in this way, during the dive, it is possible to blow air inside the mask, to compensate for the pressure and avoid suction of the mask. Small swimming goggles should not be used as they have a tendency to be suctioned to your eyes. Under strong water flow they could potentially damage your eyes. Head Torches are an essential tool for getting out of trouble in the event of unforeseen circumstances. Slower progression, injury or any other type if issue becomes essential to have a light source that allows you to continue even in the dark, or at least get in a safe position to wait for help. Each member of the team must have their own head torch. The torch has to be bright enough, possibly with two different light sources: a concentrated beam and another mode with softer lighting. Different manufacturers rate their torches more or less waterproof so upon return, open the lamp and let it dry completely, making sure the contacts and checking the seals. Always have a torch with you, even if you are only planning a short trip. One of the most critical components in the equipment canyoning, the Storage Container. This not only to keep items to stay dry but as well acting as a float inside bag in when it is transported. Dry bags are actually considered to be waterproof but sooner or later they do end up with some water in them. Double dry bags (i.e. DryBag inside another DryBag) seem to be a acceptable solution. For storage containers, many type have been tested and only a few are acceptable. The one we recommend is the standard Curtec 6 Litre Container. Head Lamp & spare batteries. Knives are essential and are used in many circumstances from setting anchors to rescue. Use a fixed blade knife with a blunt nose. Attach to your harness in the central area so ou can reach it with your left or right hand. Attach with using a breakaway cord. Knives like the CKRT Bear Claw is recommended. We recommend that at a minimum every canyoneer should take a Wilderness Medical Basic First Aid Course. You should have your own Emergency Kit that you take with you. Guides will carry and have in their cars more advanced kits. What to carry in First Aid kit depends on each particular country and what level of medical rescue you wish to provide. You can make you’re own or buy a pre made kist. Just make sure you know what is in it and that you check the contents regularly. Always carry a First Aid Kit with you even if you are only planning a short trip. Generally, when using rope you should wear a pair of gloves to protect your hands from abrasion and in case the rope moves to fast in your hands. There are several choices around from Neoprene gloves with a Kevlar lining to leather palmed used in dry environments. As always there is other equipment you may need depending on your level of canyoning. There will be other items or less items that each canyoneer uses, prefers or carries with them. Always make sure everyone in your group knows what each person is carrying. We have listed some of the items below which may be beneficial to you. Petzl Shunt: Rope Clamp. Used for ascending and other applications. Petzl Tibloc: Light weight rope grabber. Used with the Quick Draw. Micro Traxion: Pulley and Tibloc rolled into one device. Prussic Cord: Used for ascending and rescue situations. Anchor Kit: Used to placing anchors in rock or around trees.